One of the things I think we can safely say about the impact of the current economic crisis is that the face of Macro Economic theory will never be the same again. Quite what the macro economics of the future will look like is too early to say, but what is clear enough is that the existing corpus has been tested and found wanting: it’s predictive capacity is very, very limited, and this is obviously a far from satisfactory situation. At the same time, new ideas, and new perspectives are emerging. I have already spoken earlier this morning about the key issue of “non linearities” in the context of Jordi Molins’ discussion of the weaknesses of the stress test methodology. Claus has spoken about some of the issues raised by the attempt to put macro theory on micro foundations, and now I would like to present an important, if little known, piece of research coming from Latvia – one of the canaries in the coal-mine on the whole Eurozone sovereign debt issue. Eliana Marino’s work is both extremely interesting and extraordinarily important, since what it illustrates is the negative feedback mechanism that can be activated by having an “L” shaped non-recovery in a rapidly ageing society with extremely low underlying fertility. What Eliana did was something macro economists seldom consider doing, she carried out some qualitative research, rather than running a computer model, to find out just what was happening on the ground. The resulting survey, which she personally conducted in Riga from September to December 2009 and which involved some of the leading Latvian experts on migration issues, lead her to estimate that around 30,000 people may well have left Latvia in 2009 and the same number are likely to follow them in 2010. These numbers are considerably greater than the official register shows. As she argues these large emigration flows from Latvia will have a significant effect on the future demographic and economic path of the country, creating serious problems of labour shortage, unsustanability of the pension system and accelerating the already significant population decline. And just why may Latvia be a canary down the coal-mine in this context? Well think about Spain, where the housing boom attracted in the best part of 6 million people – in a country where the rate of natural change in the population was stagnant. Now imagine that with 20% unemployment as the continuing outlook for the country over the best part of the next decade, what might happen there. People could vote with their feet, and the population could contract just as rapidly as it grew, leaving that 1.5 million currently unsellable housing units even more unsellable than ever. The warning signs are there. The number of those contributing to the social security system continues to stagnate, even as unemployment remains unchanged, so where are the people? Some have obviously found their way into the growing informal economy, but others have surely left, and there is plenty of anecdotal evidence to support this idea. In addition, the rate of new household formation turned negative in the first quarter, for the first time in the series history. At the end of the day, the truth of the matter is that we really don’t know what is happening in Spain, so would the Spanish Eliana Marino please kindly step forward? 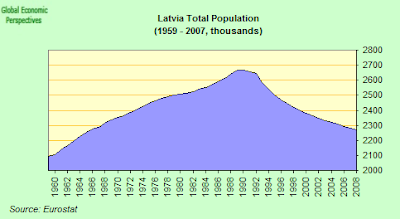 The strong recession experienced in the last few years has sadly confirmed the high propensity of Latvian people to migrate for economic reasons and generated a real â€œexodusâ€ of working age population. Before 1999, a peak of emigration was registered due to the endogenous migration potential of the collapsed Soviet Union, but, from 1999 to 2002 the outflows seemed to stabilize and to show a slowing trend. This trend changed with the accession to the European Union and the immediate application of the free movement of labour by UK, Ireland and Sweden, which decided to open their borders to New Member States immigrants without any transitional restrictions. These conditions created an increase in the number of emigrants in 2006 and the â€œoldâ€ member states definitely replaced the Russian Federation and the ex Soviet Republics as main countries of destination. More recent data were collected through the EU funded project The Geographic Mobility of the Labour Force , consisting of a survey conducted in 2007. The study arrived at the conclusion that a bit more than 40Ë™000 people emigrated between 2004 and 2005 (87% more than registered data). 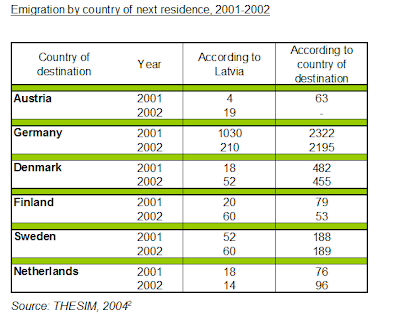 The authors forecasted that intensive emigration was expected to continue and that, looking at the number of respondents who said that they wonted to leave and at those who already did something in pursuit of this dream, by 2010 between 10Ë™000 and 16Ë™000 people were supposed to leave Latvia, thus totaling 50Ë™000 to 80Ë™000 emigrants from 2004 to 2010. The survey, which I personally conducted in Riga from September to December 2009 and which involved some of the major Latvian experts on migration issues, showed that around 30,000 people are supposed to have left Latvia in 2009 and the same number is forecasted also for 2010. These large emigration flows from Latvia will have a significant effect on the future demographic and economic path of the country, creating serious problems of labour shortage, unsustanability of the pension system and accelerating the already significant population decline. The downturn of 2008 caused an inversion of the trend: enterprises were obliged to reduce the labour force and the employment rate decreased together with the level of wages. These elements represented the main push factors for emigration and they are currently generating a real â€œexodusâ€ of the labour force, creating dangerous structural problem in Latvian economy. Actually, lack of labour and especially of high skilled professionals will be a veritable challenge for the economic recovery of the country and nowadays it is one of the main reasons of concern for Latvian politicians and intellectuals. – the most part of the outflows consists of working age population (from 15 to 65 years old) that includes people in reproductive age (from 15 to 49 years old). A huge number of emigrants in this particular age group means a further reduction of the natural increase of the population. In fact, they will probably have their children abroad or the migration decision itself will discourage the creation of numerous families. However, Latvian government recognised the need to ensure reproduction of the population as a prerequisite for the nationâ€™s existence and started to evaluate adequate tools for family support. The adoption of successful family policies made the birth rate level stabilize since 1999 and start to increase at the beginning of the XXI Century. Anyway, the total fertility rate never reached the replacement level and it is still among the lowest in the EU (average 1.4 children per woman in the period 2005-2010 ). In definitive, the results of the survey allow to conclude that Latvia needs some important structural reforms (concerning an efficient social policy, a comprehensive population policy, a strong action against corruption and a reduction of the bureaucratic burden) to be implemented by the national government in order to prepare the country to play its role at the European and international level and to take the best advantages from the opportunities provided by the integration and globalization process. The first step to achieve this objective is the promotion of a cultural change whose main goal is to dump the â€œdependency from the pastâ€ and to open mental and factual borders to modernity. What’s truly remarkable is how Latvia’s fertility rate has fallen off a cliff after the crisis. I wrote about it in the Latvia section of Crisis Demography in Eurasia. As you can see from Latvijas Statistika, the number of births has fallen by 21% in H1 2010 cf H1 2008. Since Latvia’s TFR was 1.45 in 2008, it may well have fallen to something like 1.15-1.20 by this year. Unless I’m mistaken, this is now the lowest rate in Europe. (Nor is there probably much scope for a rapid bounce back once the crisis passes, since the number of marriages has fallen by 37%). Interestingly, the other East European countries weren’t affected anywhere near as much, at least so far. Estonia’s TFR fell, but only slightly – from around 1.66 in 2008 to perhaps 1.60 in 2009, and is now showing signs of a slow turnaround. Russia’s even continued increasing, from 1.49 in 2008 to 1.56 in 2009 and perhaps 1.60 this year (based on H1 data). So there was something exceptional about the Latvian case, perhaps tied with not so much with the scale of its GDP decline (Estonia and Ukraine experienced similar falls without much effect on their TFR), but with its broad-based rollback of the welfare state. If people are leaving Spain in large numbers, where might they be going? Stagnant ? I took a look at Spanish demography in 2006. They’ve reorganised their excellent stats website since then – and for some reason the fertility stats are now only available in Spanish – or I couldn’t find them anyway. “In 1975 the average senora had 2.8 babies – well above the 2.1 replacement rate. But that rate was passed in 1981, and is currently at 1.3, having been as low as 1.1 only a few years ago. The excellent site however shows the population actually rising from 42 to 52 million by 2060. Based on ? Edward – would you consider doing a similar demographic analysis for the UK ? My gut feel is that the Brits who are leaving (for Australia, the US, Canada, New Zealand) tend to be highly educated under-40s. “There are now 3.247 million British-born people living abroad, of whom more than 1.1 million are highly-skilled university graduates, say the researchers. More than three quarters of these professionals have settled abroad for more than 10 years, according to the study by the Organisation of Economic Co-operation and Development (OECD). If they leave for the EU … they are still around. If mirgration patterns change that fast, demographic forecast aren’t worth the effort. Many people, especially in their 30s, half-emigrate – they have a spouse at home and return regularly from work thanks to cheap flights for example. Other people, especially the youngest, treat migration as a revloving door process and might return when opportunity arises.